Medical ultrasound, in which sound waves 100 to 1000 times higher in frequency than those detectable by humans are employed to generate images of tissues within the body, has been used in clinical practice to detect breast cancer for over half a century. Compared with other modalities such as digital X-rays and MRI, ultrasound has a number of key benefits: it is non-invasive, relatively inexpensive, portable and has excellent temporal resolution. 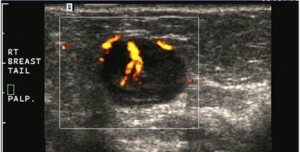 The basic principles of ultrasound are simple: a wave is generated by a transducer and propagates through the tissues; the wave is partially reflected at the interface between different tissues; the reflection is detected by the same transducer; and the time of the reflection, plus the speed of sound in the tissue, yields the position of the tissue interface. At the recent National Conference on Breast Cancer, held under the aegis of the American College of Radiology in Florida, USA, the versatility of ultrasound was highlighted. Among the advances discussed were high-frequency transducers that operate at frequencies up to 18 MHz which provide exquisite spatial resolution, revealing tumours as small as a few millimetres in diameter, although their field of view is limited to a depth of 40 mm. 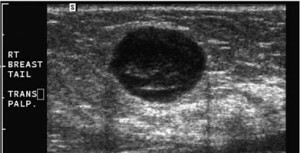 Power Doppler ultrasound, which takes advantage of the change in frequency caused by the flow of blood, is able to differentiate between a rounded hypo-echoic tumour and a cyst with low-level internal echoes, as seen below. “The detection of the smallest vessel within the lesion automatically excludes a cyst – or any other fluid collection – and confirms a neoplasm” said Bruno Fornage, a radiologist from the University of Texas. “This very simple yet very useful application of Doppler is still underused” he added. Formage also highlighted the benefits of 3D ultrasound, which enables a clinician to view a complete volume of the breast, and automated breast ultrasound (described in one of our earlier blogs), which also incorporates volumetric data. Ultrasound also has the ability to measure elasticity (click here for a previous blog) and, since breast tumours tend to be stiffer than the surrounding tissues, elastography has become a standard add-on for many commercial systems. Finally, Formage described the potential of contrast-enhanced ultrasound, in which gas-filled microbubbles are administered intravenously, but concluded that this technique was still a research tool. All things considered, however, ultrasound is an extraordinarily versatile imaging platform. I read your blog about ultra sound. I personally think we are just at the beginning. May I wish you a happy Koninginnedag! I too look forward to seeing you soon.